Lovers of hard rock will know James Christian as the mastermind of House Of Lords who are active since 1988. They released 3 albums before they broke up. After the reunion they released 8 albums, and toured. 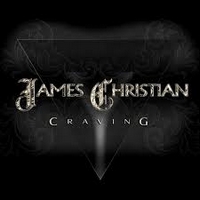 Now James Christian is presenting a solo album, his 4th solo work, which is called Craving. The album kicks off with the powerful rocker Heaven Is A Place In Hell. The chorus has an 80s feeling, but the track is a modern hard rock tune. At Wild Boys he gets a helping hand from Tommy Denander, like on some others. Wild Boys is another hard rock tune which seems to melt past and present of JCs musical career into one. For the title track he slows down and presents true AOR tune with a catchy hook. As there is a video for this one, you can check it our yourself! A touching tune is World Of Possibilities, a balladesque track which puts James Christian's vocals in the focus. Another highlight is I Won't Cry, it starts slowly and then becomes a melodic rocker, but returns to the opening theme. A melodic rocker is Love Is The Answer, again Mr. Christian's vocals are touching. Even if it's one of the heavier tracks, it is emotional and offers - once again - a great lead guitar. The riff-based rocker Black Wasn't Black would have fit to any House Of Lords album easily, but as James Christian is the driving force of HOL that's no surprise at all. Btw, at this tune Jimi Bell was showing his skills as a guitar player. Craving is more based in AOR traditions, but still offers some hard rock tunes. An album which should satisfy every AOR fan as well as hard rockers who like the soft side, too.